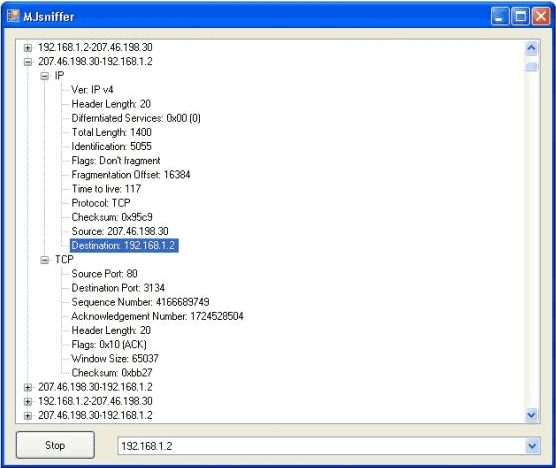 This article describes the process of creating a simple network sniffer which can parse IP, TCP, UDP, and DNS packets. For capturing the packets, we use a raw socket and bind it to the IP address. After setting the proper options for the socket, we then call the IOControl method on it. Notice that IOControl is analogous to the Winsock2WSAIoctl method. The IOControlCode.ReceiveAll implies that all incoming and outgoing packets on the particular interface be captured. The second parameter passed to IOControl with IOControlCode.ReceiveAll should be TRUE so an array byTrue is created and passed to it (thanks to Leonid Molochniy for this). Next we start receiving all packets asynchronously. So the first thing that we need to do is to parse the IP header. The stripped version of the IP header class is shown below, the comments describe the things as they happen. private ushort usFlagsAndOffset;       // Eight bits for flags and frag. Firstly, the class contains the data members corresponding to the fields of the IP header. Kindly see RFC 791 for a detailed explanation of the IP header and its fields. The constructor of the class takes the bytes received and creates a MemoryStream on the received bytes and then creates a BinaryReader to read the data from the MemoryStream byte-by-byte. Also note that the data received from the network is in big-endian form so we use the IPAddress.NetworkToHostOrder to correct the byte ordering. This has to be done for all non-byte data members. The TCP, UDP headers are also parsed in an identical fashion, the only difference is that they are read from the point where the IP header ends. As an example of parsing the application layer protocols, the attached project can detect DNS packets as well. I've searched quite a bit for a complete example, thanks for the submission!